, RED, BIOS PROFESSIONAL MEDICAL. 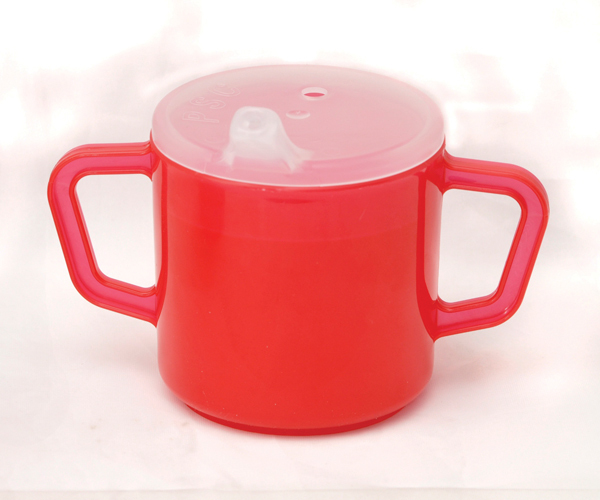 Red, plastic cup / mug with 2 handles makes drinking easier. The extra wide base provides greater stability and reduces spilling accidents. The cups can be used with either of the 2 lids or without a lid. The spout lid is contoured to fit comfortably in the mouth. The anti splash lid prevents splashing and helps to direct the flow of liquid into the mouth. Can hold 237 ml ( 8 oz) and is dishwasher safe. Great for seniors, and special needs. Popular in rest homes.